You don’t need to go to far to have an adventure! You can do it right in your town and surrounding areas. When my girls were younger we liked to explore different parks in our town and beyond. We have plenty of them with amazing playgrounds. It was so much fun. Find out where the parks are and make a plan for the summer. You and the kids will have a great time exploring new parks. And getting some fresh air. And making some new friends! To make it even more fun, bring some friends along! Take lots of photos and make a scrapbook with the kids. Include a map of the area you explored. Mark the parks you went to. Write down who you went with. And all the exciting things that were said and done. Make it not only fun but educational. Learn about flowers and trees. And if you are really adventurous…learn about bugs :). Write down a list of parks you’d like to go to. Make a plan to visit one each week. You could make it more spontaneous by writing the park names on paper slips. Put the slips in a bag or basket. And have the children take turns pulling out one on the park adventure day. And how about just stopping in a park on a way to the store! Choose two or three parks and go to all of them in one day. Have lunch in one. And an afternoon snack in another. You could bring some books to read and have a nice quiet time. You might want to pick a park with no playground for that one. And once everyone is recharged and ready to go, swing by another park on a way home. Have a dinner in the park! The kids will love that. Perhaps you could find a park with a summer concert or an outdoor movie. If it is dark enough you could do some star gazing. Or play games with glow sticks. 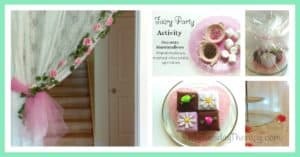 Easy, small budget activity that you all will enjoy! Check out also ideas for The Best Ice Cream Social Ever and Splashing Fun Pool Party For Little Ones. 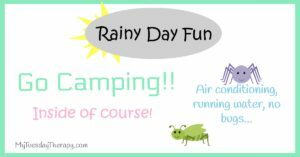 Rainy Day Fun: Camp Inside!